Friends, times are tough these days, but there is one thing in which we can all take solace: the new season of My Little Pony: Friendship is Magic is underway on the Hub after last week's third season premiere. And this week, we're getting an all new episode that tackles the hot-button issue of Pony Cloning. Seriously. 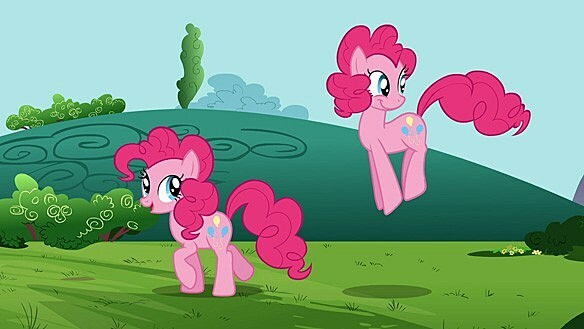 Pony Clones. Clonies. This is happening. According to the official episode description, this week's adventure kicks off with Pinkie Pie -- Equestria's most hard-partying and slightly unstable pony -- racked with Hamletesque indecision over which friend she wants to hang out with. The solution? Using the local magic pond to clone herself so that she can hang out with everyone. Considering that one Pinkie Pie causes enough trouble by her lonesome, we can only assume that multiple copies will result in some kind of Pinkiepocalypse. Catch the destruction yourself on Saturday at 10:30 AM on the Hub!